Holiday celebration is often synonymous with decadent food consumption, especially for those occasions which food plays a central role. 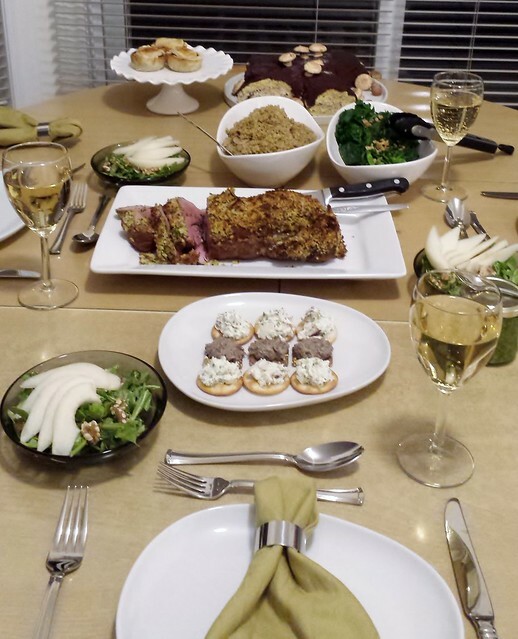 This year, I defied tradition and designed a menu for Christmas supper that did not sacrifice taste for a healthier twist. It was every bit as enjoyable and I looked forward to leftovers even as I finished the last bite on my plate. I call that a win-win situation. I went to the grocery store with every intention to get some Cornish game hens for my menu. Alas, not even a frozen one was in sight but I spotted a great deal on boneless Australian leg of lamb roast. The roast was already tightly wrapped in nets but a quick look up in my America’s Test Kitchen Menu Cookbook suggested that I unleash the meat, season it with garlic herb rub, and truss it into a uniform roll instead. Great suggestion ATK! I took the opportunity to trim away all fat and gristle from the otherwise lean roast. The garlic herb rub was made quickly in food processor with a mix of garlic, mint, rosemary, parsley, and olive oil. Part of it went to marinate the lamb, and part of it was used to season fresh bread crumbs for the crumb crust. 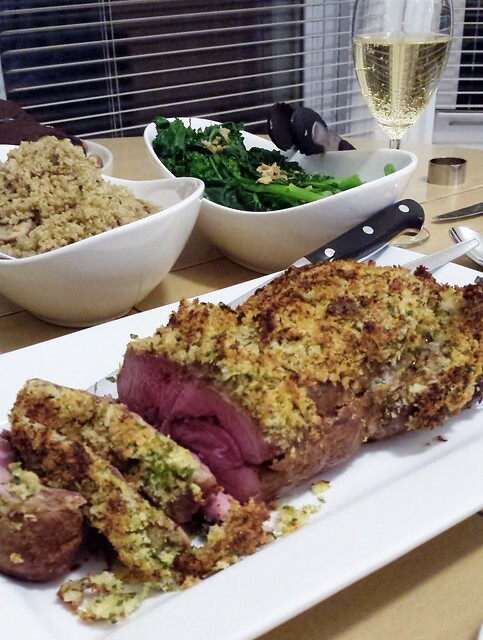 All that extra work was worth it because the lamb roast was well-seasoned and juicy medium rare. It did not need any garnish even though the mint relish added an extra layer of complexity to make a great dish memorable. As for the sides, they were all quick and easy dishes. The hardest part about the arugula, pear, and walnut salad was tossing the leafy greens with vinaigrette at just the right moment. The freekeh was cooked in a mixture of sautéed onion, thyme, and cirimini mushrooms before simmering in chicken stock. I kept the broccolini whole for a more dramatic presentation. 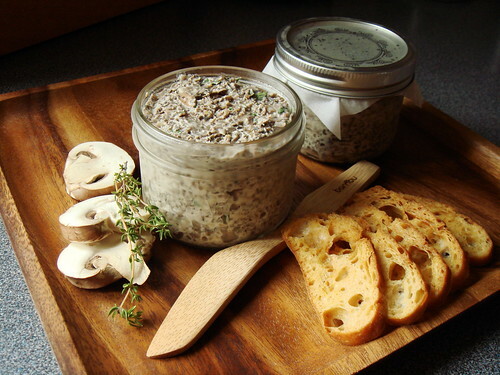 And the mushroom pate was something I already had in the fridge from other entertaining occasions. 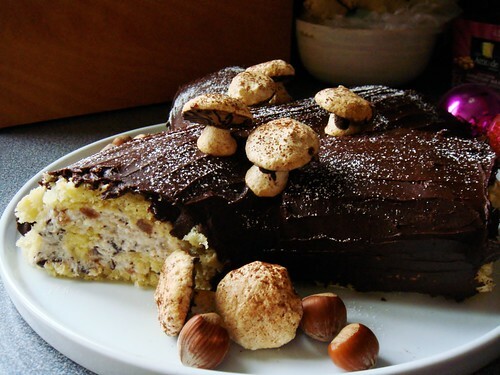 The buche de noel was the most labvour-intensive course on the menu but it was definitely the centrepiece of the evening. The smoked sturgeon goat cheese spread was the surprise of the evening. I wanted something else to complement the mushroom pate and went fridge diving. I previously purchased some lovely smoked sturgeon at the Royal Winter Fair from Northern Ontario. 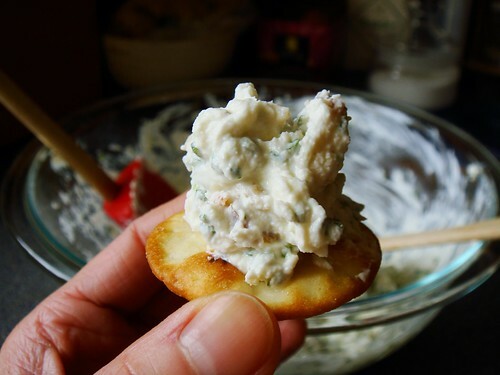 The firm-flesh smoked fish had a very assertive taste that was mellowed out by unripen goat cheese. 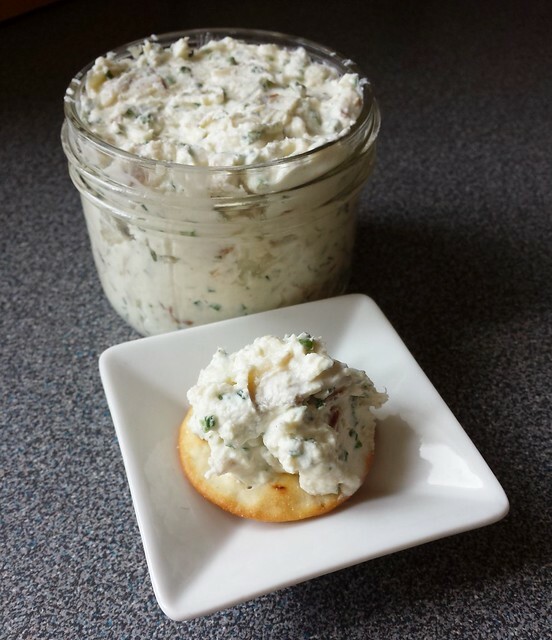 I thinned out the consistency with a bit of Greek yogurt and added some zip with fresh chopped chives. In five minutes, an appetizer was ready! Definitely a great recipe to keep in the back pocket for quick entertaining. 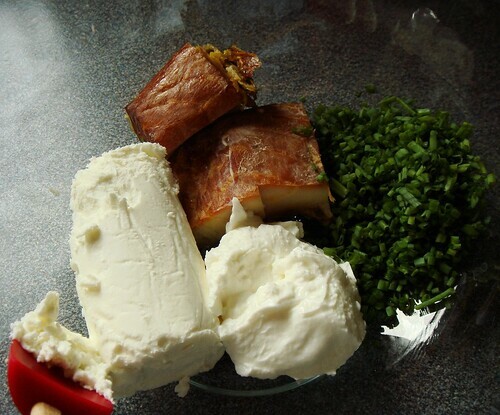 Mash everything fish, goat cheese, yogurt, and chives in a large mixing bowl until creamy. Season with black pepper. Store covered in fridge for at least two hours for flavours to meld. Serve on crackers.